You are invited to join Whatsapp group ahead of time as you will not be able to access the discussion and media shared in the group before you joined https://chat.whatsapp.com/LGlZMP08741EZIjnkQpabH Joining this group will be your way of signing up. * Feel free to post images, screenshots, videos, voice notes, documents – any media that helps you to participate in the discussion more fully. 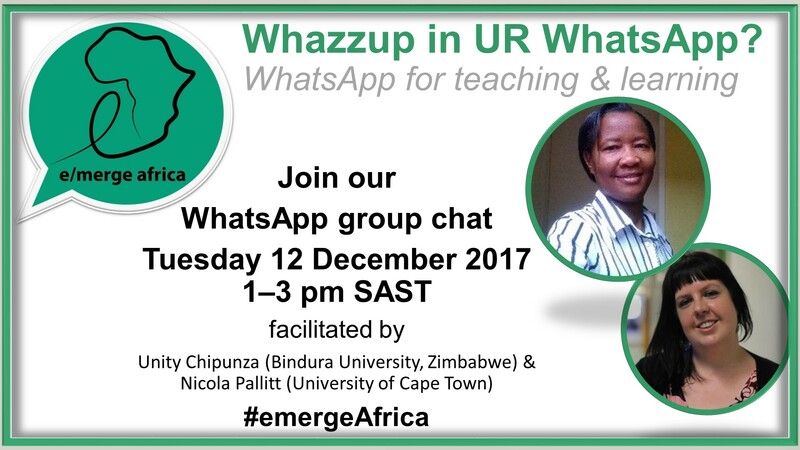 * By participating in the group you are consenting to research about the use of WhatsApp for professional development by members of e/merge Africa. Activities in the WhatsApp group will be recorded for research but not shared publicly. Instead, we will provide a summary of the discussion where individuals’ contributions are acknowledged. Depending on contributions, we will harvest collective responses to create an OER. Once the chat has ended, group members are welcome to stay and extend the conversation. What happens next is up to all of us:) The group administrators will not delete the group.